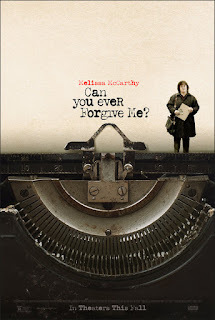 Dr. Donna's Movie Reviews: CAN YOU EVER FORGIVE ME? Nicole Holofcener (Enough Said, Please Give, Friends with Money) is one of my favorite screenwriters, and I think if the trajectory of this production had remained with her as director and Julianne Moore as the lead actress, I probably would have liked it better. My problem with this production is in what has become Melissa McCarthy’s characteristic stamp on whatever character she plays. She is a fine actress, and I keep hoping she will choose a role as a sharp woman with humor but without the zaniness like she was portrayed in Bridesmaids (that character lives on in all her subsequent performances), Identity Thief, and Tammy. In this rendition, the additional writer Jeff Whitty and director Marielle Heller infuse Lee Israel’s character with much of the McCarthy trademark—a poorly adjusted miscreant whose mouth gets her into trouble, and someone who acts like a bumbling fool, but can clean up her act under pressure at the last minute. Therefore, the first part of the film was difficult to watch, as I saw the same figure McCarthy has played in her other movies. The movie is based on a memoir written by Lee Israel. McCarthy’s character is Lee Israel, a writer who had published biographies of Tallulah Bankhead (actress) and Dorothy Kilgallen (game show panel member), which had been well received. When she wrote the third one about Estee Lauder, it did not turn out so well for various reasons, and she turned to forgery and pilfering personal letters of famous people as a way of making a living. It’s reported that she had a “difficult personality” and was an alcoholic, and these characteristics are inserted into this film. We see Lee get fired soon after the film begins for going against the rules (drinking on the job) and using foul language to a supervisor. She lives alone with her beloved cat, apparently has no friends, is behind on her rent, and is essentially down and out. When she realizes she has a personal letter from Katherine Hepburn, she sells it, and thereby gets the idea that selling letters from famous people could be lucrative. It turns out, she is a good writer on old typewriters, and collectors buy up her work, often without question. Unfortunately, Lee takes up with a drinking buddy, Jack (Grant), who has a British silver tongue, and they become partners in crime. But it eventually becomes disastrous for Lee in many respects, and she is thrown back upon herself once again. Melissa McCarthy’s talent as an actress is clearly visible in her expressions, demeanor, and her ability to inhabit a character—albeit with her own stamps clearly visible. One never forgets she is watching McCarthy; unlike, say, Meryl Streep playing Julia Child. After a while, you only see Julia. Supporting actor performances are strong: Richard E. Grant as the sleazy, greasy Jack; Jane Curtin as Lee’s exasperated agent Marjorie; Dolly Wells as Anna, a buyer who reaches out to Lee for friendship; and Anna Deavere Smith as Lee’s erstwhile lover who gave up on her. The contributions of these actors are considerable. A film for Melissa McCarthy fans with her signature character.